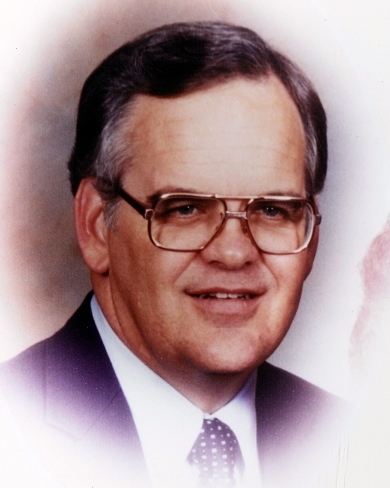 Clarence Calvin Chamberland passed away in the early morning hours surrounded by his family’s love on Thursday, January 31, 2019 in Bryan, Texas. Calvin was born October 4, 1936 in Big Spring, Texas to Charlie Rollins Chamberland and Ruby Queen Salsman Chamberland. The family moved to Hempstead, Texas, when Calvin was 2 years old. The Chamberlands were one of the founding families of the Hempstead Church of Christ. Calvin and his family were all members of the Church of Christ and most recently attended the A&M Church of Christ. His work career history began as a teen pumping gas at Henry Schumacher’s Humble Station, then Parts Manager for the Sorsby Motor Company for 10 years. His banking career began as Assistant Cashier of University National Bank of College Station, Assistant State Bank Examiner, Vice President and Director of Citizens State Bank of Hempstead, and in 1976 was the organizing President of First Bank of Snook. He was also later with other banking institutions in Caldwell, Chapel Hill, Somerville and First National Bank of Huntsville. He graduated from Hempstead High School and attended Blinn College, South Texas Junior College and Texas A&M College. He also completed a number of courses offered by the American Institute of Banking. He served as the President of the Brazos Valley Bankers Association, President of the Hempstead Chamber of Commerce, and Master of Hempstead Masonic Lodge. Family was so important to him. He loved to travel, especially to San Francisco with his wife. They marked their 50th anniversary with family by taking an Alaskan cruise. Twenty-five family members joined them on a trip to Galveston to celebrate their 60th anniversary. He leaves behind the love of his life, Sarah Lou Griffith Chamberland. They were married on October 23, 1953 over 65 years ago. Also missing him are his daughters, are Lois Winn and Lisa Palmer of College Station and Laurie Gerke, wife of Gary Gerke of Navasota. The Chamberlands have 5 grandchildren, Fran Palmer Eudoxie and husband David, David Nolen and wife Terah, Bryan Palmer, Jason Gerke and wife Janie, and Claire Gerke King and husband Kendall. Eight great-grandchildren also loved their “Pop”: Jacob, Blake, and Sloane Eudoxie, Grayson and Parker Gerke, Ezra and Cornelius Nolen, and Aubree Jo King. Calvin is also survived by his sister, Carol Eplen, her husband Bill Eplen of Waller, Texas, niece Rebecca Eplen, nephews Marc and David Chamberland, Charles and Robert Amsler. Preceding Calvin in death are his parents and his siblings Lucille Amsler and Bob Chamberland. The family wishes to thank Calvin’s entire healthcare team and many personal caregivers from the Parc at Traditions plus private sitters. In lieu of flowers, donations may be made to Hospice Brazos Valley at 502 W. 26th St., Bryan, Texas 77803 or a charity of your choice. To honor Calvin’s life, a visitation will be held from 6-8 PM on Saturday, February 2, 2019, at Hillier Funeral Home of BRYAN with a Life Celebration to begin at 1 PM on Sunday, February 3, 2019. Interment will follow at 4 PM at Hempstead Cemetery. Click here to view a webcast of the service on 2/3/2019 at 12:55 PM, Central Standard Time.